Response: The prevalence of food allergy is an increasing health problem. Although tomatoes are one of the most consumed vegetables worldwide and have health beneficial effects lowering the risk of cancer and cardiovascular diseases, patients suffering from birch pollen allergy can develop cross-reactivity after consumption of fresh tomatoes. The aim of this study was to develop an analytical method for the quantification of the birch-pollen homologous allergen Sola l 4 in various tomatoes cultivars. Furthermore, the effect of conventional or organic cultivation as well as processing techniques on Sola l 4 content was investigated. Response: The main findings were that tomato cultivars differ significantly in their allergen amount. Moreover, the allergen content decreased after drying of tomato fruits due to heat treatment. Growing conditions have a minor effect whereas seasonal effects including rainfall, humidity, temperature and pathogen infestation show a more pronounced impact. Thus, the allergen content is mainly determined by the genotype. Response: The findings about the allergen level of different tomato varieties may help to improve the food safety to potentially increase the life quality for patients suffering from birch pollen-related food allergy. For breeders, Sola l 4 can be used a marker for breeding hypoallergenic tomato varieties. Response: To obtain a clearer understanding about the allergen content in tomatoes and the effects to allergic patients, additional studies including human trials with patients allergic to tomatoes are required. The results of this study have to be confirmed by further immune tests. 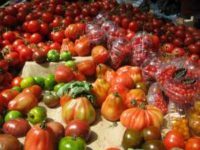 It has to be taken into account, that the severity of an allergic reaction to tomato fruit is related to the individual sensitivity and the different antibody-binding profile of affected patient suffering from tomato allergies. This entry was posted in Allergies, Author Interviews, PLoS and tagged allergens, allergies, food allergies, medical research by Marie Benz MD FAAD. Bookmark the permalink.